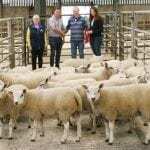 Ian Moorhouse, second from right, is congratulated on his success in Skipton Auction Mart’s annual show for Beltex-cross store lambs by judge and buyer Andrew Phillips. Right is Ian’s partner and future wife, Laura Hammond, with Laurence Pierce Wool Merchants’ Grace Dobson completing the line-up. 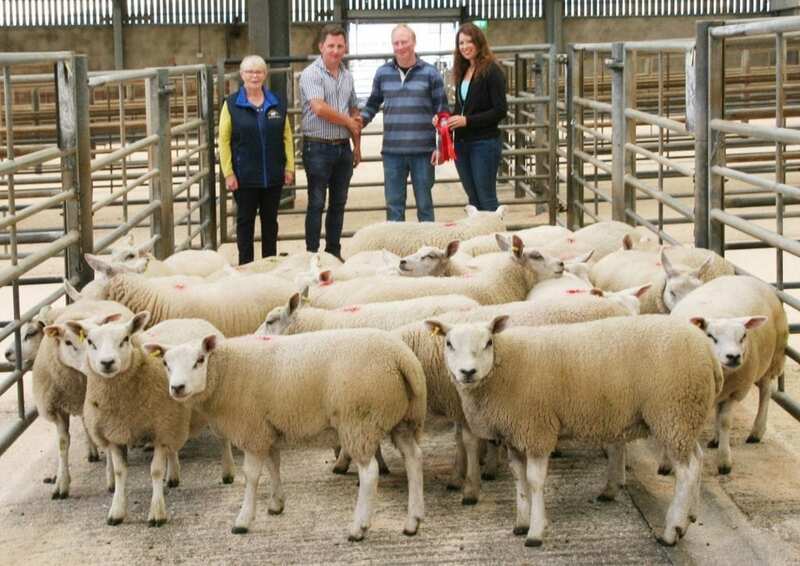 The couple, of Fouldshaw Farm, Dacre, who are set to tie the knot on Friday, August 17, tied a red rosette to their prize-winning pen of 25 lambs, which were by a selection of home-bred and bought-in Beltex tups, one of which was used by Mr Moorhouse when he also won the inaugural Skipton show in 2015. The 2018 victors were picked out by show judge Andrew Phillips, of Burton Leonard, who then transferred his interest to the ringside when purchasing the lambs for £81.50 per head, top price on the day. Beltex lambs saw an improved trade, with numerous pens selling between £68- £79 and plenty of buyers to take them there.